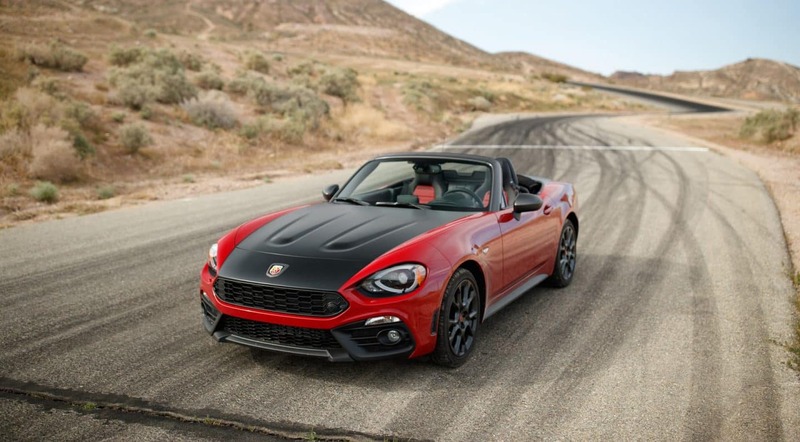 Returning with a bigger dose of the classic Italian design, horsepower, and handling attributed to the FIAT name, the 2019 124 Spider is a worthy modern adaption of the 1966 original. An exclusive turbo engine is the most powerful four-cylinder in its class, and the homage to its European racing heritage roots creates nearly a perfectly balanced vehicle that's beautiful and adventurous. This is a fun, affordable small convertible with premium styling and attitude far exceeding its humble price, giving you a one of a kind peppy summer cruiser that's built for sun and speed. What standard features are provided in the 124's trims? The 124 Spider comes in three trims, ranging from the base Classica to the athletic Abarth. Designed in Turin, Italy, this vehicle borrows design cues from the original '66 Spider and reinterprets them to suit the modern audience wonderfully. The timeless low-slung stance accentuates the classically sculpted bodyside and well-balanced proportions, carrying its sporty cabin-to-hood ratio with grace and responsive poise. The Classica supplies all you'll use on the daily, with premium black cloth seats and soft-touch materials on the instrument panel, both accented with light silver. Standard accoutrements feature air conditioning, keyless entry with push-button start, height adjustable driver's seat, and voice recognition Bluetooth. Two USB ports provide audio connection and charging for both the driver and passenger, playing personally picked music through the car's four-speaker sound system. Those who want a little more will be drawn to the midtier Lusso, providing you with automatic headlights and windshield wipers, automated climate control, and upgraded leather upholstery upon heated seats. The top tier Abarth is a more performance-tuned option, complete with a unique front and rear fascia designs, Gun Metal exterior accents, available hood stripe, and performance Recaro seats for the full sporty attitude. For 2019, all 124 Spiders are outfitted with a rear backup camera that displays via the standard 7-inch radio touchscreen. What performance can I expect out of the 2019 Spider's powertrain? Powering all trims of the 124 Spider is the exclusive 1.4-liter turbocharged MultiAir four-cylinder engine, for the first time configured with a rear-wheel drive. This combination provides 160 horsepower and 184 lb-ft torque to drivers, edging perfectly around corners and speeding through straights like a dream. It comes paired to either a six speed manual transmission, preferred for clutch slip and quicker acceleration times, or the optional six-speed automatic transmission, wonderfully short shifting and able to move up to speed nearly as quickly as the manual. These two have comparable economy with a difference of just one mile-per-gallon (26/35mpg for the manual or 25/36mpg for the automatic). New for 2019, the Abarth offers a Record Monza exhaust system for an unmistakable voice upon acceleration, giving this trim four more standard horsepower than the Spider's other two trims. What safety standards protect me? Don't equate small to not mean tough; the 2019 124 Spider's steel safety frame is specially designed to withstand and redirect crash forces around the cabin space to easily absorb collision energy away from you and your passenger. The protective system also includes four advanced multistage airbags, providing you with peace of mind. Of course, the best way to protect yourself is not to get in an accident at all and for that, the Spider offers available blind-spot monitoring and rear cross-traffic detection to assist you when changing lanes or while in reverse. Stability and traction controls make sure you don't take those curves too fast, detecting any tire slips and automatically engaging slight braking to slow the vehicle down and ensure control of the vehicle. Giving everyone an affordable, enthusiastic bridge into the convertible class, the 2019 FIAT 124 Spider is a well honed choice to enhance those sunny days with the open air experience. There's no greater answer than the Spider's responsive and peppy four-cylinder engine to give you a confident and controlled time driving through bends and cruising along straights. It's simply as fun and energetic as the car looks!